When it benefits them, chimpanzees willingly work together. Otherwise, they can’t be bothered. For humans, collaboration is rewarding for its own sake, a behavioral split that may underlie key differences between human and chimpanzee societies. Primate researchers, working with semi-free ranging chimpanzees at a sanctuary in Uganda, found chimpanzees recruit a helping partner only if it gets them more food than they’d get alone. The study, described in Animal Behavior, Sept. 7, is part of a current trend in primatology to unpick how motivation and mental state affects an animal’s interactions. The extent of human cooperation is unique, but not cooperation itself. Chimpanzees, bonobos, elephants, and many birds work together for joint rewards. For the study, Bullinger and her colleagues set food boards out of the chimpanzee’s direct reach. 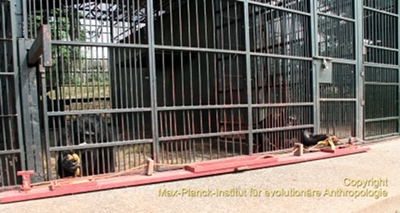 To bring the banana-bearing platforms close, the chimps pulled on a rope resting on the ground. Chimpanzees had two options. One board they could pull close solo. On another board, loose rope threaded between loops. To get these boards, both ends had to be pulled, so the chimpanzee had to go get their partner, waiting in an adjoining room. When Bullinger placed two banana pieces on the single board, and four pieces on the partner board, amounting to the same payoff for each chimpanzee, the animals chose to work alone the vast majority of the time. If another banana piece for each was added to the partner board, the chimpanzees overwhelmingly choose to collaborate. “We were a bit surprised that just one more piece made such a difference,” Bullinger said. The study implies that chimpanzees view others as social tools, as a means of maximizing their own rewards. If this represents a fundamental difference between humans and other animals, it could help explain why humans evolved to be better problem solvers, and use a wider range of habitats. How deep this social difference between humans and other primates runs isn’t certain. Primatologists aren’t sure, for example, if chimpanzees collaborate in the wild or, if they do, how much. “We’re agnostic about hunting being a cooperative activity,” said Watts, who studies chimps in Uganda at the Ngogo field site, along with his colleague John Mitani, a primatologist at the University of Michigan. Chimpanzees often hunt in large groups, 30 to 50, and move quickly through the forest. Watts is convinced that chimpanzees notice and predict the actions of others, that they play off each other and may appear to coordinate their actions. “But it’s probably a product of responding to others, not cooperation,” he said. Many researchers are interested in studying how chimpanzees hunt because, for humans, group hunting probably underpinned formation of early societies, as we transitioned from individual to collaborative foraging. For some researchers, this is too great a leap. Primatologist Victoria Horner, at Emory University, has worked with the same chimpanzees at Ngamba Island Sanctuary. Before drawing distinctions between human and chimpanzee motivation, she would like to see exactly comparable studies, requiring humans to collaborate over food, rather than games. Image: Anke Bullinger/Max Planck Institute for Evolutionary Anthropology. Citation: “Chimpanzees, Pan troglodytes, prefer individual over collaborative strategies towards goals.” By Anke Bullinger, Alicia Melis, and Michael Tomasello. Animal Behavior. Sept. 7.